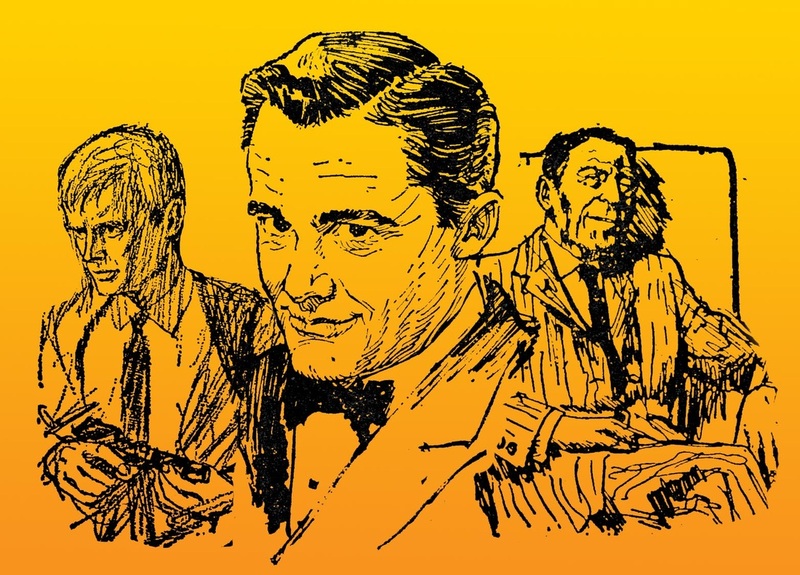 From its premiere on Sept. 22 1964 to the release of the major motion picture for the summer of 2015, “The Man from UNCLE” has continued to entertain audience around the world for 50 years. This is Robert Vaughn, formerly known as Napoleon Solo. It is indeed a pleasure to be able to send this greeting to the many loyal fans of The Man From U.N.C.L.E. that will be gathering in Los Angeles to commemorate the 50th anniversary of the show’s premiere. I am sorry I am not able to attend as I will be traveling in Europe but I wanted to note this occasion by thanking The Golden Anniversary Affair for inviting me to this special celebration, and especially to thank all of you, the many loyal fans of the show, for keeping the flame alive for half a century. It is not an understatement to say that without you, the fans, the show would never have been successful in the 1960s, and it would not enjoy the revered status it has today, decades later. My time on the show was a pleasant and wonderful experience, and obviously an important part of both my professional career and my life. I was honored to work with an exceptionally talented cast and crew, including of course David McCallum and Leo G. Carroll, as well as associate producer George Lehr, director of photography Fred Koenemkamp and director Joe Sargent, who I understand will be with you at your event. These men, over the course of the show were instrumental in its success. Again, I am sorry I am not able to join you in person, but rest assured I will be there with you in spirit, celebrating 50 years of one of the most remarkable series in television history, The Man From U.N.C.L.E. I will be unavailable for the anniversary gathering but I wish you all well and thank you for keeping the memory of U.N.C.L.E. alive. Robert Short and Jon Heitland are pleased to announce, through the generous start up support of Lisa Lazarus, “The Golden Anniversary Affair” - a private two day event "Somewhere in Los Angeles", Sept. 26th-27th, 2014, celebrating a half century of U.N.C.L.E..
On Friday, Sept. 26th there will be an exclusive “The Man from U.N.C.L.E.” MGM /SONY Studios tour of the entire lot, that features a visit inside STAGE 10 where U.N.C.L.E HQ once stood. (Providing there is no production shooting on the stage). and share U.N.C.L.E. stories, meet new friends, learn more about U.N.C.L.E. and maybe even grab an autograph or two. Saturday Sept 27th, at The Doubletree Hotel-Culver City, the Affair will feature a cast and crew reunion, an early evening soiree, panels and presentations by U.N.C.L.E. aficionados about U.N.C.L.E., past and present, as well as the U.N.C.L.E. museum filled with rare, original props and other surprises. Those unable to attend but who would like to be a part of U.N.C.L.E. history can also donate to help offset the costs, and will receive U.N.C.L.E. – related souvenirs as well as an acknowledgment of their generosity on the website. Come celebrate with us the show that changed all our lives. mid-60s and was nominated for Emmys, Grammys and won the Golden Globe for Best Series in 1966.
the 1983 TV movie reunion. as agents Napoleon Solo and Illya Kuryakin who co-starred with Hitchcock perennial Leo G. Carroll as U.N.C.L.E. an Alice in Wonderland that lay just beyond the normal world. The tailor shop you just stumbled into just might be U.N.C.L.E. Headquarters or that little mid-town garage... a Thrush satrap? Viewers never knew what evil plans for global conquest could be hiding behind that next door. The show dealt with serious issues - WWIII, chemical weapons, unseen forces controlling world events, yet with Solo and Kuryakin on the mission, in less than an hour, the world would once again be safe for all. That is, at least until next week's episode when an innocent school teacher or unwitting tourist would suddenly be thrust into the struggle between good and evil...U.N.C.L.E. versus Thrush! swingingest spy show ever to grace the airwaves of the world. Channel D is waiting for you. 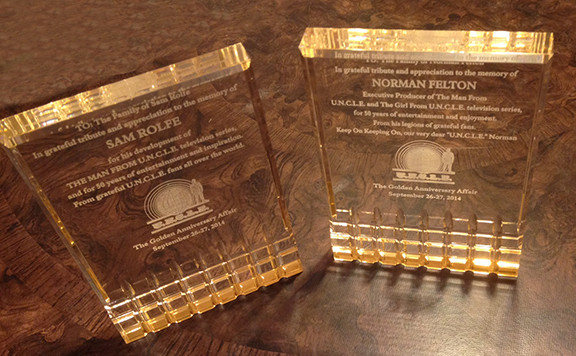 We are proud to announce that on Saturday the 27th there will be a special ceremony in honor of Norman Felton and Sam Rolfe in appreciation of their creative genius in creating "The Man from U.N.C.L.E." and that special plaques will be presented to their families in honor the occasion. Attendees can look forward to our special New U.N.C.L..E. Recruit Satchel, provided by Lisa Lazarus, filled with cool U.N.C.L.E. agent essentials like an U.N.C.L.E. Enforcement Agent License Plate Frame, Flashlight /Screwdriver, logo magnet, U.N.C.L.E. ID card and Communicator Decoy Pen created exclusively for this "Affair". Each attending agent will be issued a replica U.N.C.L.E. ID security badge that will be required for entrance to all areas of the event. Don't worry about which number you'll get because they will all be #50 in honor of U.N.C.L.E.s 50th. Through the generous contribution of CINEMARETRO Magazine we are proud to announce that every attendee will receive this magnificent 11"x14" litho of Robert Vaughn as U.N.C.L.E. enforcement agent Napoleon Solo as special parting gift! Here you will be able to keep up with the behind-the-scenes efforts of putting the event together, releases of never-before-seen photos and trivia questions offering special merchandise and memorabilia for prizes. Link at top of this page. This event and website is not endorsed, sponsored or affiliated with Warner Bros. The "Man from U.N.C.L.E. trademarks and logos are owned by Warner Bros. It is not meant to be an infringement on the property rights of any of the trademark or copyright holders. Also this website is not affiliated with any of the vendors or other websites whose links appear here. 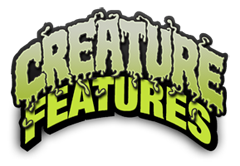 Cast and crew appearances are considered tentative and subject to change. Check back frequently for updates. NOTE: ALL DONATIONS ARE NON-REFUNDABLE AND NON-EXCHANGEABLE, unless the event is cancelled at which time your donations will be refunded. Still and video photography is for personal use only - commercial use strictly prohibited. By attending The Golden Anniversary Affair (TGAA) you agree to allow your image to be used on our website and in news documentaries or stories, either filmed by TGAA or other entities. All donation amounts are subject to change, please order as early as possible. In the unlikely event of a cancellation of the TGAA, or a date change, TGAAis not responsible for refunding airfare or any other costs other than the payments made directly to TGAA for ticketing. Also in the unlikely event, due to weather, transit issues or last minute illness or other reason given by celebrity, an advertised guest does not make their appearance at the TGAA, TGAA is not responsible for any refunds.